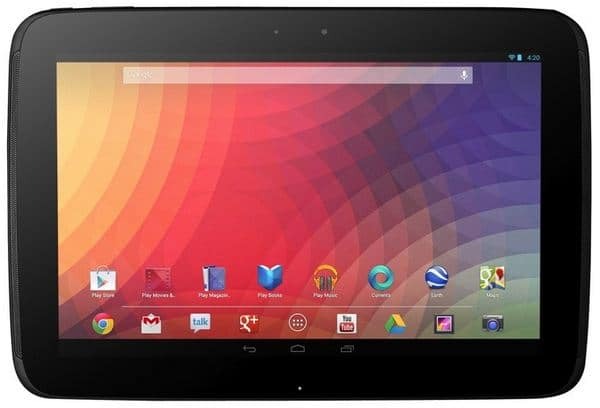 Google on Monday announced its newest tablet, the Nexus 10 made by Samsung. The Nexus 10 has a 2560 x 1600 pixel display for 300 ppi on a Corning Gorilla Glass 2. Like any new device, the Nexus 10 runs on the latest Android update, Android 4.2 Jelly Bean with a 9000 mAh Lithium polymer that can last up to nine hours of video and more than 500 hours of standby time, according to Google. Internally, the Nexus 10 has the same specifications as the leaked Nexus 10on Friday. Inside it has a dual-core 1.7 GHz Exynos 5250 CPU, Mali T604 GPU, 16GB of internal storage, with 2GB of RAM. The back camera has 5 megapixel while 1.9 MP at the front camera. Wirelessly, the Nexus 10 is equipped with 802.11 b/g/n (MIMO+HT40) WiFi, Bluetooth 4.0, and Android Beam NFC chip. With 263.9 x 177.6 x 8.9 mm dimensions, the 10-inch Tablet weights 603g and offers and a variety of connectivity including Micro USB, Magnetic Pogo pin charger ,Micro HDMI, and 3.5mm headphone jack. The Nexus will be available in 16GB costing $399 and 32GB for $499, both WiFi only – no cellular data. It will launch on November 14 in the U.S., U.K., Australia, France, Germany, Spain, Canada and Japan.